There is evidence of a fledgling university in Exeter dating from 1225. In that year, one Gilbert le Blond granted to St John's Hospital School the sum of 2s (10 pence) per year for the rent of some shops in Smythen Street for the purpose of a 'school'. At this time, a school was a place at which learned teachers and students gathered. Smythen Street ran parallel with Preston Street, or the 'street of priests'. Exeter had in excess of 30 churches, none of which were attached to a parish - hence their priests lived in a street of their own. This proximity to Preston Street, made the position of a seat of learning in Smythen Street a sensible choice as the clergy were the intellectual thinkers of their time. However, Oxford was being established as a university and during this period was attracting students from all over the country - the more central position favoured Oxford, and Exeter's embryonic university did not progress any further. 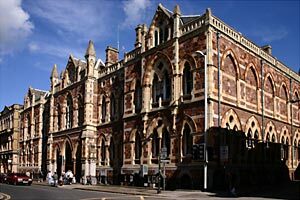 The origins of the modern University lie in the establishment of the Royal Albert Memorial Museum. Fund raising for the museum started in 1861 as a memorial to Prince Albert who had died earlier in the year. Land was donated by Richard Somers Gard MP, in Queen Street, and the foundation stone laid in 1865. 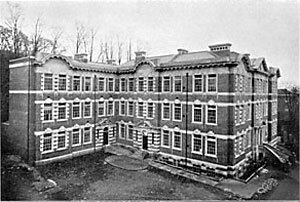 The first phase of the building was completed in 1869. In addition to the Museum, the existing School of Science and School of Art which were first opened in North Exeter after the Great Exhibition in 1851 were installed in the new museum building. A Free Public Library was also opened. 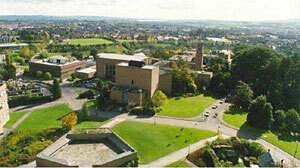 It was the School of Science that was the sapling that became Exeter University. In 1893, with support from the University of Cambridge, the two schools became the Exeter Technical and University Extension College. It became the Royal Albert Memorial College in 1900 and made the short move to a new building at the top of Upper Paul Street. 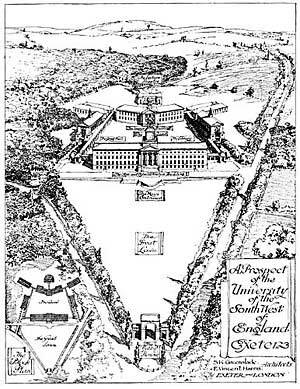 In 1922 it was again renamed, as the University College of the South West of England, and then finally the college received its Charter as the University of Exeter in 1955. It was at this time that the gradual move to the Streatham Estate from central Exeter took place. The vacated premises in Bradninch Place, Gandy Street were to become the Exeter Phoenix Arts Centre. Her Majesty the Queen Elizabeth visited the new University in 1956 to formally present the charter.. The area that the University moved to, on the Streatham Estate, was situated in the ancient area of Duryard. From Saxon times this was a royal hunting ground which stretched from the northern wall of the city to the river opposite Pynes - in fact Duryard means 'deer park'. Around about 1700, the city sold off large parts of Duryard for what would be large private houses. In 1867, the Exeter millionaire, Richard Thornton West, a retired East India merchant purchased some land on the hill in Duryard and built Streatham Hall in the Italianate style. It was this estate that was purchased to serve as the centre of the University. Between 1963 and 1968, the student population almost doubled. A large expansion in facilities also took place, with no fewer than ten major buildings added on the Streatham estate as well as halls of residence for around 1,000 students. The Chemistry and Physics departments had new buildings. The Queen's Building for use by the Arts Faculty opened in 1959 and the Amory Building, housing Law and Social Sciences, in 1974. The other important eductional institution in Exeter, St Lukes College of Eductaion, became the School of Education when it was incorporated into the University. The Camborne Mining School was also absorbed into the University in 1993. Close links with several prominent Middle Eastern Gulf States resulted in generous grants to build a new University Library in 1983 and a social and study centre for postgraduate students in 1991. An Institute of Arab and Islamic Studies has also been opened to encourage the links. The opening of the Northcott Theatre on the University campus in 1967 gave the local population a chance to develop a relationship with the institution. In addition, the Great Hall is often used for public concerts and for vote counting at elections. In 1995, Her Majesty Queen Elizabeth and Prince Philip visited the University for its 40th anniversary celebrations. In 1996 and 1998 the University received the Queen's Anniversary Prizes for research into, respectively diabetes and children's health and exercise. The Peninsula Medical School, a new medical school to be run jointly by the Universities of Exeter and Plymouth and the NHS in the region was opened in 2001 for its first intake of student doctors.